Our favorite time of the year is upon us. The cold weather is fading away and we’re hanging up our winter coats to welcome the spring season with open arms. There are so many things about Spring 2017 we’re looking forward to: the release of Beauty and the Beast on March 17, Lady Gaga at Coachella, and the arrival of Beyoncé’s twins, of course. In the midst of all that excitement, though, spring is an opportune time to check in with your health and make the necessary adjustments to your lifestyle. Think of it as hitting the reset button — and what better way to start fresh than adding some more yoga to your life? The spring months are naturally a time when we become more active. It’s not as freezing cold outside, so we’re more compelled to throw some running shoes on and take a walk around the block. In addition to all your outdoor activities, adding more yoga classes to your schedule could improve your overall health and make spring even more enjoyable. The benefits of yoga are well known — it decreases anxiety and stress, improves the health of your heart, and strengthens your short term memory — but spring is an especially good time to amp up your yoga practice. Allow us to explain. 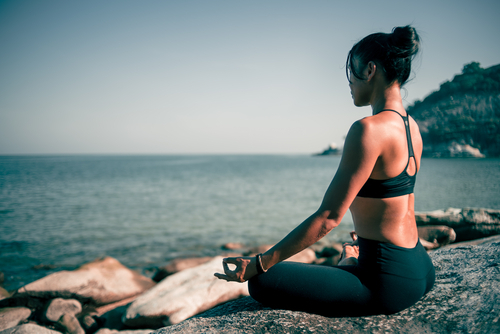 Here are eight reasons you should do more yoga this spring. Have you ever walked out of a sweaty yoga class feeling like you could run the world? You’re not the only one. Many people who do yoga regularly report feeling stronger and happier about the skin they’re in. Studies have even shown that young women experience an increase of self-confidence and self-esteem after doing yoga. As we move into the warmer months, the advertisements around us are going to change. We’re going to see things that try to get us to work out more or lose weight, all in the chase of a “bikini body” (PS — you were born with a bikini body). If you ever feel overwhelmed by it all, getting down and dirty in a yoga class can help you love your body, come back to your center, and realize that you are perfect just the way you are. You’re out doing all sorts of things during the spring — hiking, running, playing sports, etc. Keeping up a regular yoga practice will keep your joints healthy and your muscles supple, so you run less of a risk of getting injured from any strenuous activity. At the very least, yoga makes you more aware of your body, which helps you notice when you’re pushing yourself too hard. You know this already and you’ve probably heard it a million times. But it’s true — yoga really does reduce your anxiety and stress, and it teaches you coping mechanisms to deal with the chaos that gets thrown your way. According to Harvard researchers, yoga helps to modulate your stress responses long after you’ve rolled up your mat. It reduces your blood pressure and improves your mood. Spring is a season full of social events, like parties, reunions, and weddings. It can get difficult to balance it all along with work and your personal life. Maintaining a yoga practice will equip you with the strength and tranquility you need to get through it with a smile on your face. The last thing you want to do is be inside an office all day when the sun is shining outside. But even though you’re happy to finally get off work, you might find that you’ve got some aches and pains from sitting at the desk all day. Suddenly it’s not so easy to enjoy your evening activities. Going to yoga on the regular will keep you flexible and agile, and it will allow more movement to come back into your body. That’s exactly what you need after staying seated for eight hours a day. If you’re feeling exhausted after work, you don’t have to go to the most rigorous yoga class. A gentle Yin yoga class is a great way to unwind and stay flexible. We all feel like being more social when the warm weather hits. You’d be surprised at how easy it is to make friends with the yogis at your local studio. If you practice regularly you’ll gradually get to know the people around you, and you may even make some friends that bring new color to your life. You might start a new hobby together or attend some cool events you never considered going to before. Besides, they’ll motivate you to go to class when you’re feeling a little bit lazy. Getting involved with your local yoga studio has more benefits than just doing yoga regularly. Studios often host things like kirtans (collective singing or chanting) and workshops, and they might even be connected to non-profits in the area that give you the chance to volunteer for a cause you believe in. If you’re looking to add some variety to your life, your yoga studio may be just the place to find it. With your social life getting busier by the minute, you might be find yourself traveling more than usual. Dealing with jet lag and uncomfortable car rides is never fun, but if you incorporate some yoga into your life, those aches and pains may affect you a lot less. Even if you’re on the road, you can use a yoga app like YogaGlo to get your daily fix. One of the best things about welcoming spring is the change in cuisine. There are more fresh fruits, rhubarb pies, and delicious iced teas. It may sound unbelievable at first, but the more yoga you do, the more spidey senses you cultivate. You become more aware and you senses become sharper. You eventually start craving healthier foods to nourish your body, and those foods will taste better than ever.